For other uses, see Chinese wall (disambiguation). Chinese city walls (traditional Chinese: 城牆; simplified Chinese: 城墙; pinyin: chéngqiáng; "city wall") refer to defensive systems used to protect towns and cities in China in pre-modern times. In addition to walls, city defenses often included towers and gates. The most specific Chinese word for a city wall is chéngqiáng (城墙), which can be used in two senses in the modern Chinese language. It broadly refers to all defensive walls, including the Great Wall of China, as well as similar defensive structures in areas outside of China such as Hadrian's Wall. More specifically Chengqiang refers to defensive walls built around a city or town. However in classical Chinese, the character chéng (城) denoted the defensive wall of the "inner city" which housed government buildings. The character guō (郭) denoted the defensive wall of the "outer city", housing mainly residences. The phrase chángchéng (長城), literally "the long wall", refers to the Great Wall. Colloquially chéng referred to both the walls and city so that both were synonymous with each other. A city was not a city without walls, however large it may be. There is no real city in Northern China without a surrounding wall, a condition which, indeed, is expressed by the fact that the Chinese use the same word Ch'eng for a city and a city wall: for there is no such thing as a city without a wall. It is just as inconceivable as a house without a roof. It matters little how large, important, and well ordered a settlement may be; if not properly defined and enclosed by walls, it is not a city in the traditional Chinese sense. Thus, for instance, Shanghai (outside the "native town"), the most important commercial centre of modern China, is, to the old-fashioned Chinaman, not a real city, only a settlement or a huge trading centre, grown out of a fishing village. And the same is true of several other comparatively modern commercial centres without encircling walls; they are not ch'engs, or cities, according to traditional Chinese conception, whatever modern republican officials may choose to call them. The Stone City is a wall in Nanjing dated to the Six Dynasties (220～589). Almost all of the original city is gone, but portions of the city wall remain. Not to be confused with the City Wall of Nanjing. The invention of the city wall is attributed to the semi-historical sage Gun (鯀) of the Xia dynasty, father of Yu the Great. The traditional narrative tells that Gun built the inner wall to defend the prince and the outer wall to settle the people. An alternative narrative attributes the first city wall to the Yellow Emperor. A number of neolithic walls surrounding substantial settlements have been excavated in recent years. These include a wall at a Liangzhu culture site, a stone wall at Sanxingdui, and several tamped earthen walls at the Longshan culture site. In 15th century BC the Shang dynasty constructed large walls around the site of Ao with dimensions of 20 meters in width at the base and enclosed an area of some 2,100 yards (1,900 m) squared. Walls of similar dimensions were also found at the ancient capital of the state of Zhao, Handan (founded in 386 BC), also with a width of 20 meters at the base, a height of 15 meters, and a length of 1,530 yards (1,400 m) along its two rectangular sides. Most settlements of significant size possessed a city wall from the Zhou dynasty onwards. The city wall of Pingyao were first constructed between 827 BC and 782 BC during the reign of King Xuan of Zhou. The city walls of Suzhou followed afterward under largely the same plan created by Wu Zixu in the 5th century BC. and lasted until their demolition in the 1960s and 1970s. Sieges of city walls (along with naval battles) were portrayed on bronze 'hu' vessels dated to the Warring States (5th century BC to 3rd century BC), like those found in Chengdu, Sichuan, China in 1965. The walls of Han dynasty Chang'an were completed in 189 BC and covered a perimeter of 25.5km while the later Eastern Han capital of Luoyang measured 4.3km by 3.7km. By the end of the Eastern Han dynasty local gentry, clansmen, and villagers built more confined defensive structures in the form of square forts known as wū bì (塢壁). These were erected in remote countrysides and had particularly high walls, cornered watchtowers, and gates to the front and back. According to Stephen Turnbull, the wū bì are the closest approximation to the concept of a European castle that has ever existed in Chinese history. Under the Sui dynasty, the capital of Chang'an was renamed Da Xingcheng and its outer wall was expanded to cover a perimeter of 35km. Under the Tang dynasty, the capital of Chang'an's outer walls measured 9.72km east to west by 8.65km north to south. Under the Jin dynasty the capital of Zhongdu had walls covering a perimeter of 24km and reached a height of 12m. Meridian Gate, the front entrance to the Forbidden City, with two protruding wings. Chinese city walls tended to be rectangular or square in shape. Philosophical and even feng shui considerations were adopted in siting gates, towers, and the city itself. Chinese cities were rarely centered on a castle. Instead, the city's administrative center was spread over a relatively large area, which may or may not have been surrounded by a second set of "inner" walls similar in shape and construction to the main outer wall. Long-term strategic considerations meant that the walls of important cities often enclosed an area much larger than existing urban areas in order to ensure excess capacity for growth, and to secure resources such as timber and farmland in times of war. The city wall of Quanzhou in Fujian still contained one quarter vacant land by 1945. The city wall of Suzhou by the Republic of China era still enclosed large tracts of farmland. The City Wall of Nanjing, built during the Ming dynasty, enclosed an area large enough to house an airport, bamboo forests, and lakes in modern times. Where allowed by geography, Chinese city walls are rectangular in shape, with four orthogonal walls. Some wall systems are composed of a number of such rectangles, set adjacent to or concentrically within each other. For example, the city wall of Beijing is composed of four rectangles: a wider outer city to the south, a narrower inner city to the north, an imperial city within the inner city, and the Forbidden City at the centre of that. The walls could be constructed of a variety of materials. Common materials included rammed earth, compressed earth blocks, brick, stone, and any combination of these. Standardized walls during the Ming and Qing dynasties were composed of a core of compressed earth and mixed debris, strengthened by various binders. The walls were then surfaced with bricks. It was topped with crenellations facing out, and a parapet facing in. Gates were placed symmetrically along the walls. The principal gate was traditionally located at the centre of the south wall. Gatehouses were generally built of wood and brick, which sat atop a raised and expanded section of the wall, surrounded by crenellated battlements. A tunnel ran under the gatehouse, with several metal gates and wooden doors. Camouflaged defensive positions are placed along the tunnel (in an effect similar to murder holes). Gatehouses were accessed by ramps, called horse ramps or bridle paths, (Chinese: 马道; pinyin: mǎdào), which sat against the wall adjacent to the gate. An "archery tower" was often placed in front of the main gatehouse, forming a barbican (Chinese: 瓮城; pinyin: wèngchéng). In its final form during the Ming and Qing dynasties, the archery tower was an elaborate construction, of comparable height to the main gatehouse, which stands some distance in front of the main gatehouse. At its base was a gate. The archery tower is so-named because of its rows of archery (and later cannon) placements, from which defenders could fire projectiles on attackers. Auxiliary walls, running perpendicularly to the main wall, connect the archery tower with the main gatehouse, enclosing a rectangular area. This area serves as a buffer zone, should the first gate be breached. Its Chinese name, "jar walls", refers to the intended strategy whereby attackers coming through the archery tower would be trapped in the barbican, open to attack from all sides. In large gates there may be multiple barbicans – the main gate of Nanjing (Gate of China, Nanjing) had three barbicans, forming the most elaborate system still in existence in China. Towers that protruded from the wall were located at regular intervals along the wall. Large and elaborate towers, called corner towers (角楼, Jiǎolóu), were placed where two walls joined (i.e. at corners). These were significantly higher than the wall itself, and gave defenders a bird's eye view over both the city and its surroundings. In larger cities, a moat surrounded the wall. This could be connected to canals or rivers both in the city and outside, thus providing both a defense and a convenient transportation route. Nearby waterways might be adopted or altered to connect to, or form part of, the moat. A model of a typical Chinese city wall. While China was the birthplace of gunpowder the guns there remained relatively small and light, weighing less than 80 kilograms or less for the large ones, and only a couple kilograms at most for the small ones during the early Ming era. Guns themselves had proliferated throughout China and become a common sight during sieges, so the question has arisen then why large guns were not first developed in China. According to Tonio Andrade, this was not a matter of metallurgy, which was sophisticated in China, and the Ming dynasty did construct large guns in the 1370s, but never followed up afterwards. Nor was it the lack of warfare, which other historians have suggested to be the case, but does not stand up to scrutiny as walls were a constant factor of war which stood in the way of many Chinese armies since time immemorial into the twentieth century. The answer Andrade provides is simply that Chinese walls were much less vulnerable to bombardment. Andrade argues that traditional Chinese walls were built differently from medieval European walls in ways which made them more resistant to cannon fire. Chinese walls were bigger than medieval European walls. In the mid-twentieth century a European expert in fortification commented on their immensity: "in China … the principal towns are surrounded to the present day by walls so substantial, lofty, and formidable that the medieval fortifications of Europe are puny in comparison." Chinese walls were thick. Ming prefectural and provincial capital walls were ten to twenty meters thick at the base and five to ten meters at the top. In Europe the height of wall construction was reached under the Roman Empire, whose walls often reached ten meters in height, the same as many Chinese city walls, but were only 1.5 to 2.5 meters thick. Rome's Servian Walls reached 3.6 and 4 meters in thickness and 6 to 10 meters in height. Other fortifications also reached these specifications across the empire, but all these paled in comparison to contemporary Chinese walls, which could reach a thickness of 20 meters at the base in extreme cases. Even the walls of Constantinople which have been described as "the most famous and complicated system of defence in the civilized world," could not match up to a major Chinese city wall. Had both the outer and inner walls of Constantinople been combined, they would have only reached roughly a bit more than a third the width of a major wall in China. According to Philo the width of a wall had to be 4.5 meters thick to be able to withstand artillery. European walls of the 1200s and 1300s could reach the Roman equivalents but rarely exceeded them in length, width, and height, remaining around two meters thick. It is apt to note that when referring to a very thick wall in medieval Europe, what is usually meant is a wall of 2.5 meters in width, which would have been considered thin in a Chinese context. There are some exceptions such as the Hillfort of Otzenhausen, a Celtic ringfort with a thickness of forty meters in some parts, but Celtic fort-building practices died out in the early medieval period. Andrade goes on to note that the walls of the marketplace of Chang'an were thicker than the walls of major European capitals. Aside from their immense size, Chinese walls were also structurally different from the ones built in medieval Europe. Whereas European walls were mostly constructed of stone interspersed with gravel or rubble filling and bonded by limestone mortar, Chinese walls had tamped earthen cores which absorbed the energy of artillery shots. Walls were constructed using wooden frameworks which were filled with layers of earth tamped down to a highly compact state, and once that was completed the frameworks were removed for use in the next wall section. Starting from the Song dynasty these walls were improved with an outer layer of bricks or stone to prevent corrosion, and during the Ming, earthworks were interspersed with stone and rubble. Most Chinese walls were also sloped rather than vertical to better deflect projectile energy. The Chinese Wall Theory essentially rests on a cost benefit hypothesis, where the Ming recognized the highly resistant nature of their walls to structural damage, and could not imagine any affordable development of the guns available to them at the time to be capable of breaching said walls. Even as late as the 1490s a Florentine diplomat considered the French claim that "their artillery is capable of creating a breach in a wall of eight feet in thickness" to be ridiculous and the French "braggarts by nature." In fact twentieth century explosive shells had some difficulty creating a breach in tamped earthen walls. We fought our way to Nanking and joined in the attack on the enemy capital in December. It was our unit which stormed the Chunghua Gate. We attacked continuously for about a week, battering the brick and earth walls with artillery, but they never collapsed. The night of December 11, men in my unit breached the wall. The morning came with most of our unit still behind us, but we were beyond the wall. Behind the gate great heaps of sandbags were piled up. We 'cleared them away, removed the lock, and opened the gates, with a great creaking noise. We'd done it! We'd opened the fortress! All the enemy ran away, so we didn't take any fire. The residents too were gone. When we passed beyond the fortress wall we thought we had occupied this city. Andrade goes on to question whether or not Europeans would have developed large artillery pieces in the first place had they faced the more formidable Chinese style walls, coming to the conclusion that such exorbitant investments in weapons unable to serve their primary purpose would not have been ideal. 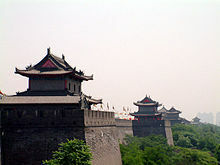 The city walls of Beijing, the last imperial capital of China, survived in substantially complete form into the 1950s. But apart from the Forbidden City, whose walls remain well-preserved, city walls from the Ming Dynasty have suffered wholesale demolition in the decades since. The only surviving sections are Qianmen's gate and arrow tower, Deshengmen's arrow tower, a section of the wall and Southeast Corner Tower preserved in the Ming City Wall Relics Park, and the Xibianmen corner tower. The Yongdingmen Gate was rebuilt in 2005. Of the walls of other major historical cities, those of Nanjing, Xi'an and Kaifeng are notable for their state of preservation. The walls of Nanjing and Xi'an are Ming Dynasty originals with extensive Qing Dynasty and modern restorations, while the wall of Kaifeng visible today is largely the result of Qing Dynasty restoration. The walls of some smaller cities and towns have survived more or less intact. These include the walls of Pingyao in Shanxi, Dali in Yunnan, Jingzhou in Hubei, and Xingcheng in Liaoning. Smaller garrison towns or fortifications include Diaoyu near Chongqing, Wanping county fortifications near Marco Polo Bridge in Beijing, the garrison town of Shanhai Pass, and Qiansuo in Huludao, Liaoning. Isolated remnants and some modern recreations can be seen today in many other cities. The walls of Luoyang in Henan survive as heavily eroded remains. The surviving walls of Shangqiu in Henan, while extensive, have heavily deteriorated over time. Only small parts of the city walls protecting the Confucian compound in Qufu are authentic, the rest having been demolished in 1978 and rebuilt in recent years. Some isolated gates of Hangzhou and Suzhou (especially Panmen Gate) have either survived or been rebuilt. Substantial remains of the gates of Zhengding in Hebei have survived but the walls have largely been stripped to their earthen core. One small section of the city wall of Shanghai is visible today. Sections of a court painting depicting the Emperor's entry into Beijing in 1689. The first section shows, at right, the barbican at today's Qianmen gate. The third section shows, at right, the Meridian Gate in the south wall of the Forbidden City. ^ a b Síren 1924, p. 1-2. ^ Turnbull 2009, p. 7. ^ Turnbull 2009, p. 7-8. ^ Turnbull 2009, p. 8. ^ Turnbull 2009, p. 9. ^ Turnbull 2009, p. 11. ^ Yu, Zhuoyun (1984). Palaces of the Forbidden City. New York: Viking. ISBN 0-670-53721-7. ^ a b Andrade 2016, p. 96. ^ Andrade 2016, p. 92. ^ a b Andrade 2016, p. 97. ^ Purton 2009, p. 363. ^ a b Andrade 2016, p. 98. ^ Andrade 2016, p. 339. ^ a b Andrade 2016, p. 99. ^ Andrade 2016, p. 100. ^ a b Andrade 2016, p. 101. ^ Lorge 2008, p. 43. ^ Cook 2000, p. 32. Needham, Joseph (1986). Science and Civilization in China: Volume 4, Part 3. Taipei: Caves Books Ltd.
Needham, Joseph (1986). Science and Civilization in China: Volume 5, Part 6. Taipei: Caves Books Ltd.